[Kenneth Wilke] is undertaking a noble quest – to build a homebrew microcomputer, based around the venerable 6502. As a prelude to this, he set out to interface the hallowed CPU to an FPGA, and shared the process involved. [Kenneth] is using an Arty A7 FPGA development board which is a great fit for purpose, having plenty of I/O pins and being relatively easy to work with for the home tinkerer. This is an important consideration, as many industrial strength FPGAs require software licences to use which can easily stretch into the tens of thousands of dollars. The 6502 is placed on a breadboard, and a nest of wires connects it to the PMOD interfaces of the Arty board. Then it’s a simple job of mapping out the pins on the FPGA and you’re good to go. Due to the 6502’s design it’s possible to step through instructions one at a time, and this is particularly useful on a basic homebrew build so [Kenneth] was sure to implement this functionality. It’s all capped off with the FPGA sending the 6502 a starting address and a series of NOPs, to demonstrate the setup is capable of running the 6502 with instructions fed from the FPGA. It’s a project that shows the fundamentals of interfacing two technologies that are widely spread out in sophistication, and acts as a great base for further experimentation. We can’t wait to see what [Kenneth] does next, as we’ve seen great things before. We recently looked at the origins of the integrated circuit (IC) and the calculator, which was the IC’s first killer app, but a surprise twist is that the calculator played a big part in the invention of the next world-changing marvel, the microprocessor. There is some dispute as to which company invented the microprocessor, and we’ll talk about that further down. But who invented the first commercially available microprocessor? That honor goes to Intel for the 4004. We pick up the tale with Robert Noyce, who had co-invented the IC while at Fairchild Semiconductor. In July 1968 he left Fairchild to co-found Intel for the purpose of manufacturing semiconductor memory chips. While Intel was still a new startup living off of their initial $3 million in financing, and before they had a semiconductor memory product, as many start-ups do to survive they took on custom work. 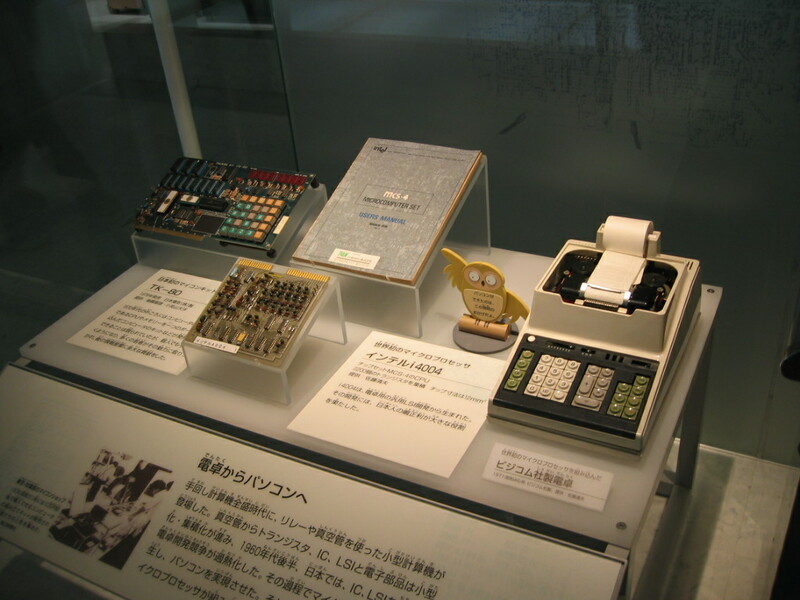 In April 1969, Japanese company Busicom hired them to do LSI (Large-Scale Integration) work for a family of calculators. Busicom’s design, consisting of twelve interlinked chips, was considered a complicated one. For example, it included shift-register memory, a serial type of memory which complicates the control logic. It also used Binary Coded Decimal (BCD) arithmetic. Marcian Edward Hoff Jr — known as “Ted”, head of the Intel’s Application Research Department, felt that the design was even more complicated than a general purpose computer like the PDP-8, which had a fairly simple architecture. He felt they may not be able to meet the cost targets and so Noyce gave Hoff the go-ahead to look for ways to simplify it. Modern microprocessors are a marvel of technological progress and engineering. At less than a dollar per unit, even the cheapest microprocessors on the market are orders of magnitude more powerful than their ancestors. The first commercially available single-chip processor, the Intel 4004, cost roughly $25 (in today’s dollars) when it was introduced in 1971. The 4-bit 4004 clocked in at 740 kHz — paltry by today’s standards, but quite impressive at the time. However, what was remarkable about the 4004 was the way it shifted computer design architecture practically overnight. Previously, multiple chips were used for processing and were selected to just meet the needs of the application. Considering the cost of components at the time, it would have been impractical to use more than was needed. That all changed with the new era ushered in by general purpose processors like the 4004. Suddenly it was more cost-effective to just grab a processor of the shelf than to design and manufacture a custom one – even if that processor was overpowered for the task. That trend has continued (and has been amplified) to this day. Your microwave probably only uses a fraction of its processing power, because using a $0.50 processor is cheaper than designing (and manufacturing) one tailored to the microwave’s actual needs. Anyone who has ever worked in manufacturing, or who has dealt with manufacturers, knows this comes down to unit cost. Because companies like Texas Instruments makes millions of processors, they’re very inexpensive per unit. Mass production is the primary driving force in affordability. But, what if it didn’t have to be? Professors [Rakesh Kumar] and [John Sartori], along with their students, are experimenting with bespoke processor designs that aim to cut out the unused portions of modern processors. They’ve found that in many applications, less than half the logic gates of the processor are actually being used. Removing these reduces the size and power consumption of the processor, and therefore the final size and power requirements of the device itself. Of course, that question of cost comes back into play. Is a smaller and more efficient processor worth it if it ends up costing more? For most manufacturers of devices today, the answer is almost certainly no. There aren’t many times when those factors are more important than cost. But, with modern techniques for printing electronics, they think it might be feasible in the near future. Soon, we might be looking at custom processors that resemble the early days of computer design. If you maintain an interest in vintage computers, you may well know something of the early history of the microprocessor, how Intel’s 4-bit 4004, intended for a desktop calculator, was the first to be developed, and the follow-up 8008 was the first 8-bit device. We tend to like simple stories when it comes to history, and inventions like this are always conveniently packaged for posterity as one-off events. If we have to make a list of Projects that are insane and awesome at the same time, this would probably be among the top three right up there. For the past few years, [James Newman] has been busy building Megaprocessor – a huge micro-processor made out of transistors and LED’s, thousands of ’em. “I started by wanting to learn about transistors. Things got out of hand.” And quite appropriately, he’s based out of Cambridge – the “City of perspiring dreams“. The Why part is pretty simple – because he can. We posted about his build as recently as 10 months back, but he’s made a ton of progress since then and an update seemed in order. How big is it ? For starters, the 8-bit adder module is about 300mm (a foot) long – and he’s using five of them. When fully complete, it will stretch 14m wide and stand 2m tall, filling a 30 sq.m room, consisting of seven individual frames that form the parts of the Megaprocessor. The original plan was for nine frames but he’s managed to squeeze all parts in to seven, building three last year and adding the other four since then. Assembling the individual boards (gates), putting them together to form modules, then fitting it all on to the frames and putting in almost 10kms of cabling is a slow, painstaking job, but he’s been on fire last few months. 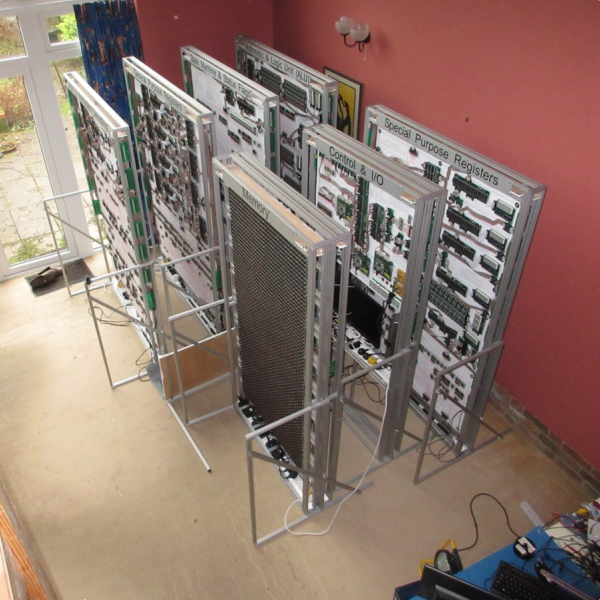 He has managed to test and integrate the racks shown here and even run some code. The Megaprocessor has a 16-bit architecture, seven registers, 256bytes of RAM and a questionable amount of PROM (depending on his soldering endurance, he says). It sips 500W, most of it going to light up all the LED’s. He guesses it weighs about half a ton. The processor uses up 15,300 transistors and 8,500 LED’s, while the RAM has 27,000 transistors and 2,048 LED’s. That puts it somewhere between the 8086 and the 68000 microprocessors in terms of number of transistors. He recently got around to calculating the money he’s spent on this to date, and it is notching up over 40,000 Quid (almost $60,000 USD)! You can read a lot of other interesting statistics on the Cost and Materials page. [Elliot Williams’] column, Embed with Elliot, just did a great series on interrupts. It came in three parts, illustrating the Good, the Bad, and the Ugly of using interrupts on embedded systems. More than a few memories floated by while reading it. Some pretty painful because debugging interrupt problems can be a nightmare. One of the things I’ve learned to watch out for over the years is the subtlety of stack based languages, like C/C++, which can ensnare the unwary. This problem has to do with the corruption of arrays of values on a stack during interrupt handling. The fix for this problem points up another one often used by black hats to gain access to systems.